Here are the currently active Freecharge Coupons in March 2016. Use these Promo Codes and Cashback Offers to save money while doing online recharge at Freecharge via website or its Mobile App. Max Cash back of Rs.50 per transaction. Valid Three times per User/Credit/Debit Card/Mobile Number. Valid on credit/debit card and FreeCharge Balance transactions. Not Valid for Add Cash and Net banking Transactions. Offer not valid for Airtel transactions (Post-paid/Prepaid/DTH) Offer valid on FreeCharge App, Web & mWeb. Max Cashback of Rs.100. Valid only one per New User/Credit/Debit Card/Mobile Number. Valid on Credit/Debit card/Net banking and FreeCharge Balance. Not valid for Add Cash & Airtel Post-paid/Prepaid/DTH/Landline. Offer valid only on FreeCharge App, Web & mWeb. Cashback offer can be availed on 2 transactions per unique user – mobile number / email id / Visa Credit/ Debit card holder. Customer needs to use Visa Credit or Debit Card to avail Cashback offer, not valid for “Add Cash” transactions, net-banking transactions and payment via FreeCharge balance as payment option. Offer is valid for all products Post-Paid Mobile / Prepaid Mobile / DTH & Data Cards / Electricity, Gas & Landline Bill Payment / Metro available on FreeCharge. Not valid on Airtel (Prepaid/Postpaid/ DTH). Max cashback of Rs. 100. Valid once per user/credit/debit card/mobile number. Not Valid for transactions done via FreeCharge Balance & Netbanking. These Freecharge Coupons are not valid for Airtel transactions. Virtual Cards & Cards issued outside India will not be eligible for cashback / reward. Max cashback of Rs. 50. Valid once per user/credit/debit card/mobile number. Valid on Credit Card/Debit Card & FreeCharge Balance. Not Valid for transactions done via Netbanking. Offer not valid for Airtel transactions. Virtual Cards & Cards issued outside India will not be eligible for cashback / reward. Flat ​cashback of Rs.50. Valid only Once per User/Credit/Debit Card/Mobile Number. Valid on ​Credit/​Debit card & FreeCharge Balance transactions only. Cashback will be credited to your FreeCharge Wallet which can be redeemed within 185 days from date of credit, and is non transferable. Not Valid for transactions done via Net​b​anking. Not valid ​on Airtel transactions. Offer not valid on virtual Cards and International Cards which are issued outside India. Valid on successful Postpaid Bill payments. Maximum cashback of Rs.100. Valid once per user/credit/debit card/mobile number. Valid on Credit Card/Debit Card/FreeCharge Balance. Cashback will be credited to your FreeCharge Wallet which can be redeemed within 185 days from date of credit, and is non transferable. Offer is not valid on Netbanking, Virtual Cards & Cards issued outside India will not be eligible for cashback / reward. Offer not valid on Airtel transactions. Freecharge is a business unit of Accelyst Solutions Pvt. Ltd. And its focus is to create an innovative channel that can deliver more for less to the Indian consumer. They not only make the process of recharging convenient but also rewarding, by way of discount coupons. It provides Freecharge Coupons to its customers from time to time. The super efficient and professionally sound team makes sure the customers are 100% satisfied. It helps customers recharge their prepaid mobile phones, DTH connections or data cards, make bills payment etc. For every recharge done on Freecharge, it gives you discount coupons from top food joints and popular retailers, equivalent to your recharge amount, delivered to your mobile, inbox or doorstep. Use the coupons to save money when you eat out, watch movies, book travel tickets, shop online, visit a salon, go gaming, pick up books, music, groceries, and live a rewarding life. 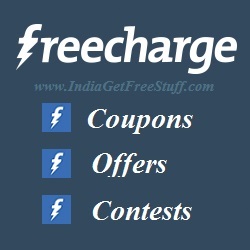 Use Freecharge coupons to save money while recharging online.